Our kitchen papers are totally made in Japan. They are very soft, but the strength is enough to use. Our kitcken papers are used at many Japanese restaurants and hotel kitchens. We will develop the products for your request. Please contact us from the "Questions and Requests" form. 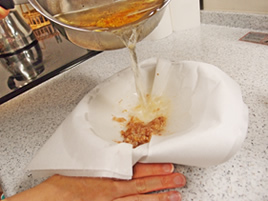 We produce coffee filter, teabag, kitchen paper and cooking paper. Variety of our products are used with food. We have variety of papers for food; wrapping paper for hamburger, band for dry noodles, etc.